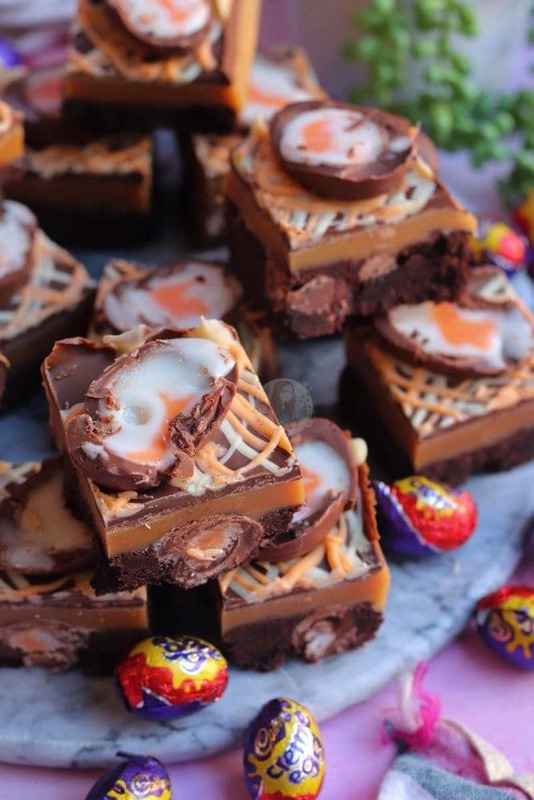 Chocolate Shortbread stuffed with Mini Creme Eggs, Homemade Caramel, and Even more Chocolate Creme Egg Goodness! 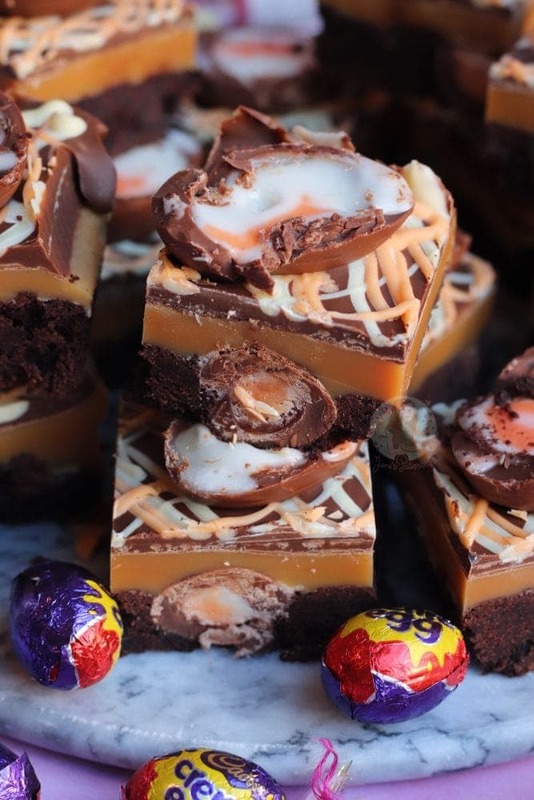 Creme Egg Millionaires Shortbread HEAVEN! It’s getting so much closer to Easter, and I am freaking out slightly at how quickly this year is going. Not only is it basically already Easter, but that means my wedding is getting closer and closer and well yeah. It’s going to be a busy year. I’ve mentioned this in the past, but Creme Eggs seem to be one of the most controversial of Easter Treats… and I can kinda understand why. They aren’t my favourite, but I can definitely appreciate them. 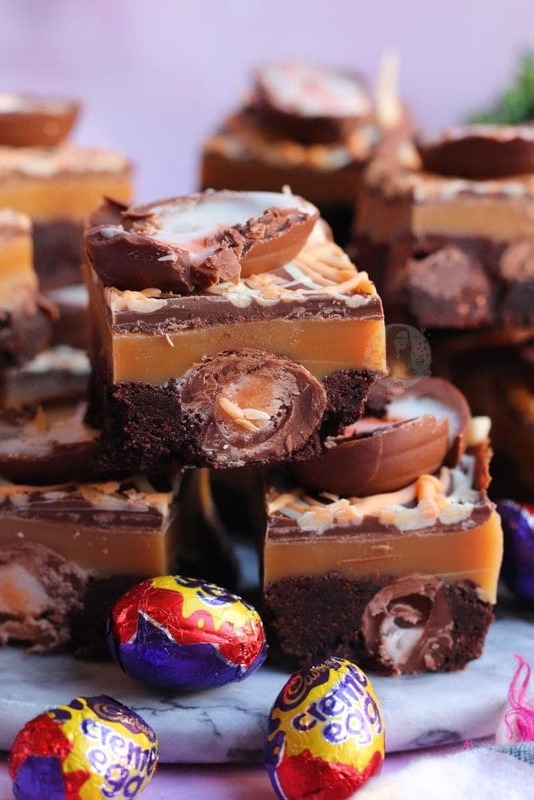 I have always been a Mini Egg girl, but some of you are Creme Egg OBSESSED! They are incredibly sweet, and that is probably what most people who don’t like them think… so I thought I’d take that sweetness even further, and just flat out offend the Creme Egg haters. 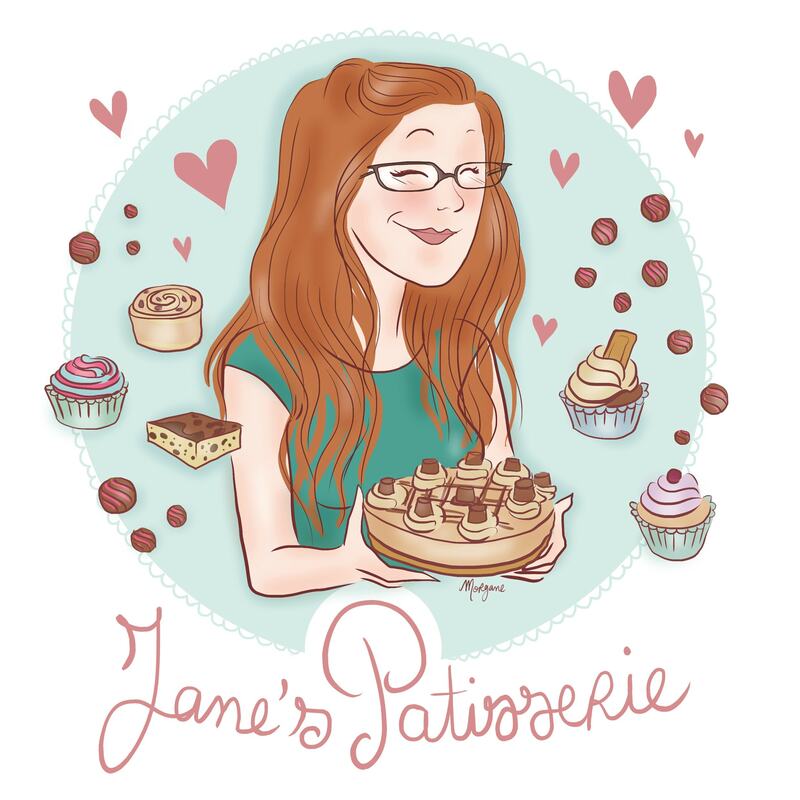 If you don’t like sweet food, you are probably reading the wrong blog anyway… but this particular recipe?! It’s a whole new level of sweet. 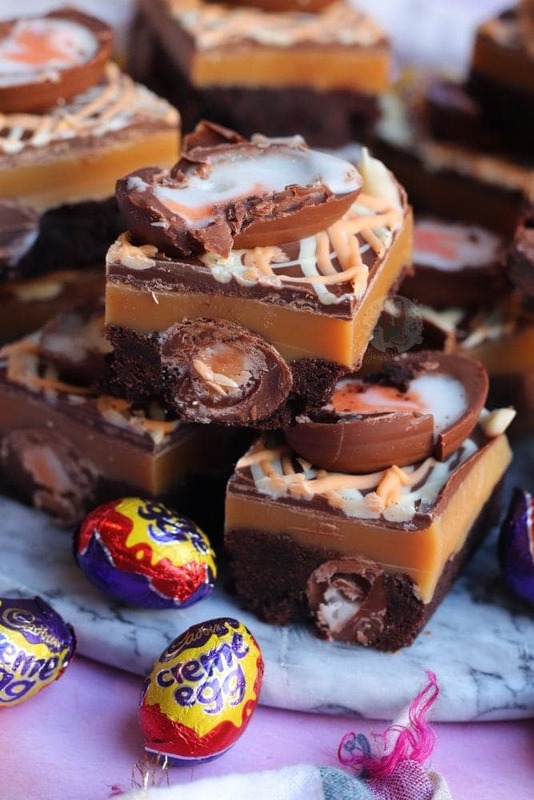 Creme Egg stuffed Chocolate Shortbread, a delicious Homemade Caramel, and SO MUCH MORE CHOCOLATE. Heaven. 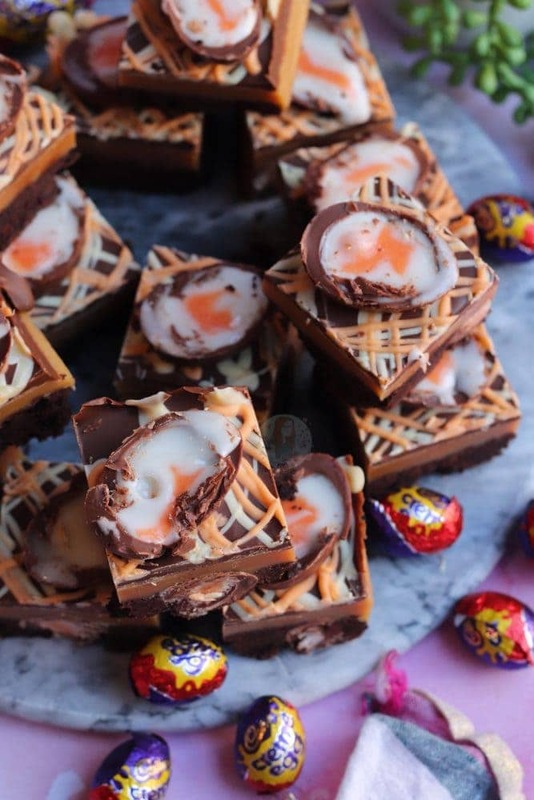 I’ve always stated how I prefer Creme Eggs to be baked into things, rather than eating them outright… and that might sound a little weird as… even more sugar makes them better?! Well… yeah it kinda does. I think its partly down to texture, and then the other flavours take away sweetness, or just alter it slightly to be able to not make my teeth ache too much. Yes, caramel is sweet, but I genuinely find that this kind of Caramel isn’t too sweet at all! If you think you’re going to be smart, and switch the Caramel to be an already made one (such as the Carnations Caramel), then I really wouldn’t. I’ve had people be all smartarse and say it, but then moan that it doesn’t set solid. It’s not designed to set solid, and THAT kind of caramel is SO sweet. The Shortbread, even when stuffed with Creme Eggs is just wonderful. 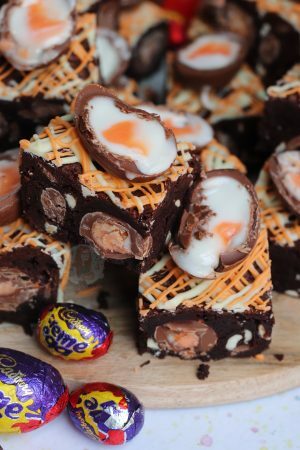 You can’t go too overboard and add in endless amounts of Creme Eggs because it would get quite expensive, and it would most likely affect the bake. 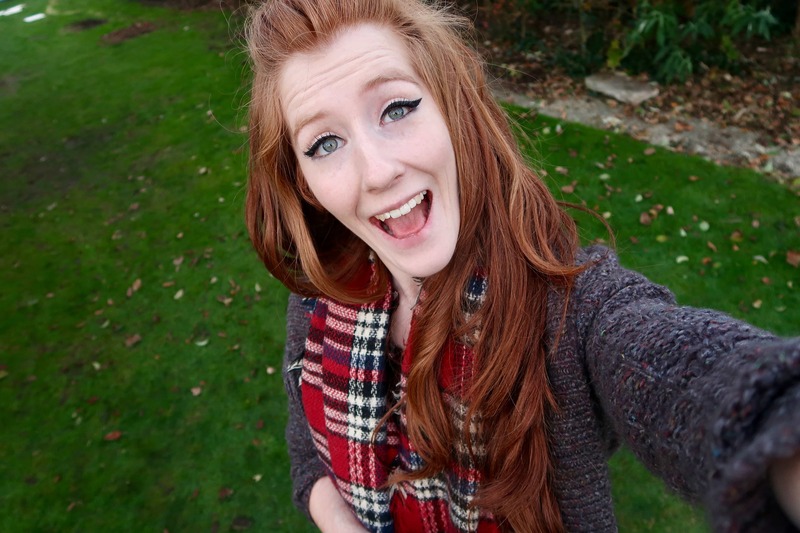 I use 3x the Mini Creme Egg packets, and it works perfectly! The Caramel itself is something that you kinda just need to practice. I get the occasional comment saying “Why haven’t you put the thermometer temperature it needs to reach” and that’s because I don’t make this kind of caramel to a temperature. It’s literally based on time, and a medium-high heat. Some people may do this differently, but any other Millionaires Shortbread recipe that I have looked at, has never made the caramel to a temperature either. Once you get the hang of making it, you’ll never have an issue! The only thing I will say that personally, I find making it on a Gas hob SO MUCH BETTER. 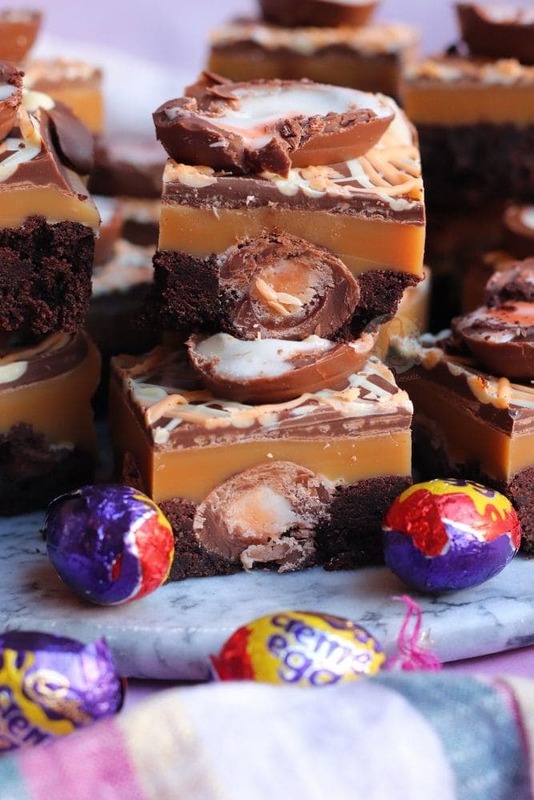 The Chocolate on the top of the Millionaires is optional… but, wonderful. 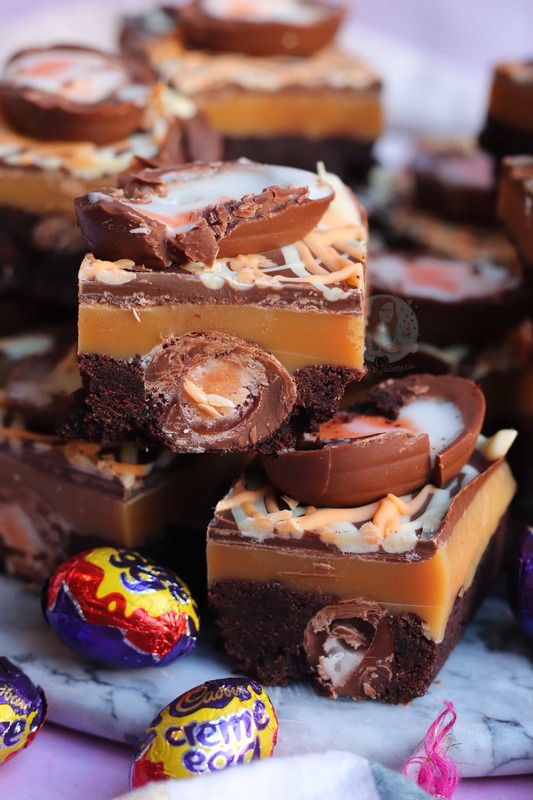 I usually obviously go for a Chocolate top, and then the chocolate of choice sprinkled on top – but this time I thought I would attempt to decorate the top a smidge more – and colour the white chocolate to be Creme Egg themed. This is optional, but I would 100% recommend the Rainbow Dust Pro Gel colours for this! Alternatively, you can use Sugarflair colours which are also amazing. Supermarket own colouring might make it seize and go a little pastey, just so you know! One thing I do feel like I have to mention, is to LINE YOUR TIN. I would feel that this is obvious as I mention in the method, right at the beginning, but I must say it again… LINE THE TIN. Also, if you wonder what Tin I use – I recommend this 9″ square deep cake tin! 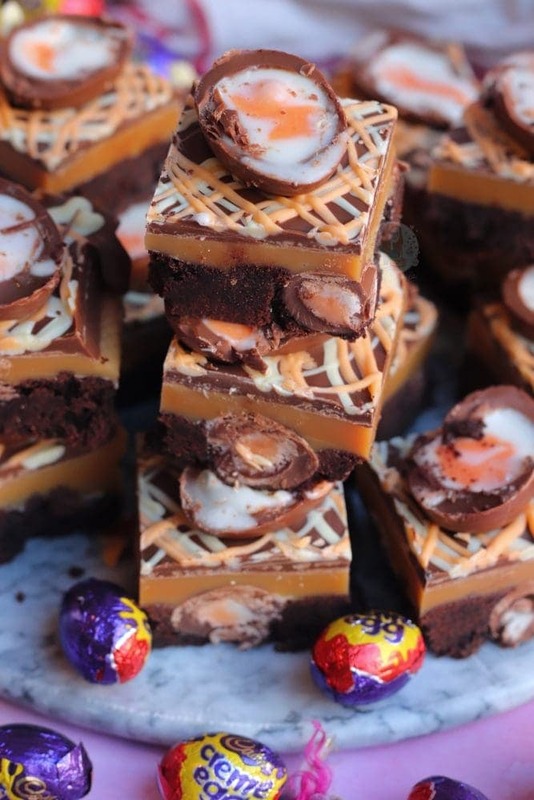 Buttery Chocolate Shortbread stuffed with Mini Creme Eggs, Homemade Caramel, and Even more Chocolate Creme Egg Goodness! Preheat your oven to 180C/160C Fan, and line a 9x9inch deep square tin with parchment paper. Cream together your Butter and Sugar until fluffy, and then add in the Flour and Cocoa Powder and beat again till a dough is formed! 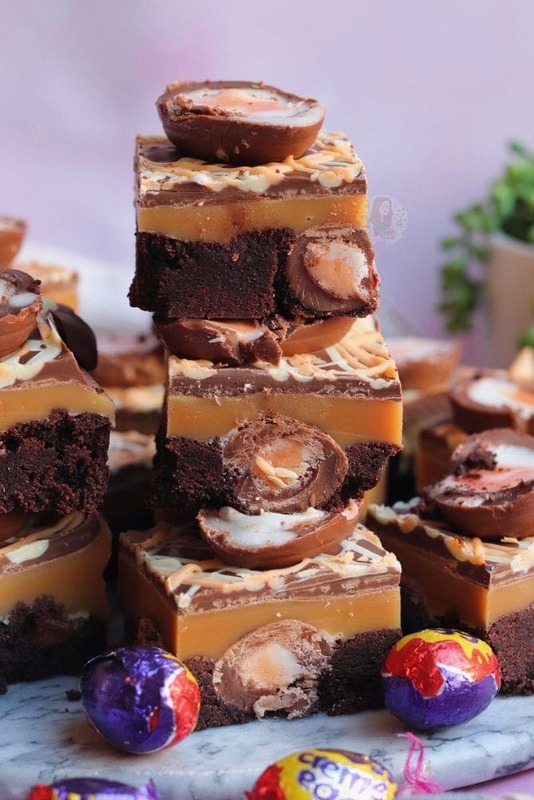 Add in your frozen Mini Creme Eggs, and then add to the bottom of the Cake Tin. Bake in the oven for 25 minutes (and dry looking on the top). Once baked, remove from the oven and leave to cool whilst doing the rest! In a large heavy-based sauce pan, add your Condensed Milk, Sugar, Syrup and Butter. Heat on a low heat, stirring, so that the butter melts and the sugar dissolves. Once everything is melted, turn your heat up to a medium-high heat (on the middle sized hob ring), and boil for 5-7 minutes whilst stirring constantly. Be careful as you make it, because the caramel is very very very hot. It'll be ready when the mixture has turned to a darker golden! Pour onto the shortbread, and leave to set on the side for a few hours, or in the fridge for an hour. Melt your Milk Chocolate carefully, and then pour over the caramel. Melt the White Chocolate, and split into two. 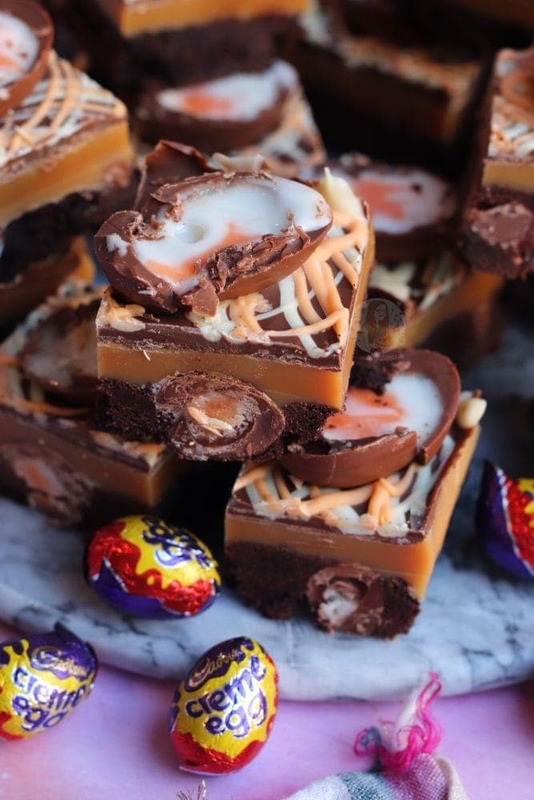 Add a dash of orange food colouring to a half, and then drizzle both over the milk chocolate - the colours should resemble the insides of a Creme Egg. 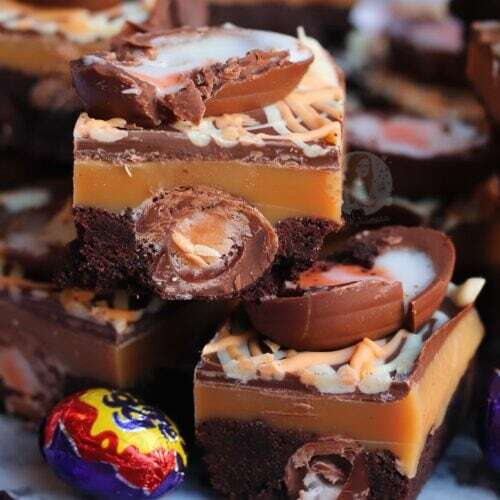 Halve your Creme Eggs, and add on top of the Chocolates - leave to set on the side for a few hours, or in the fridge for an hour or so! It is best to use Unsalted Butter for the caramel, and not a spread/baking spread. If you caramel is extremely solid, you've over done it slightly. 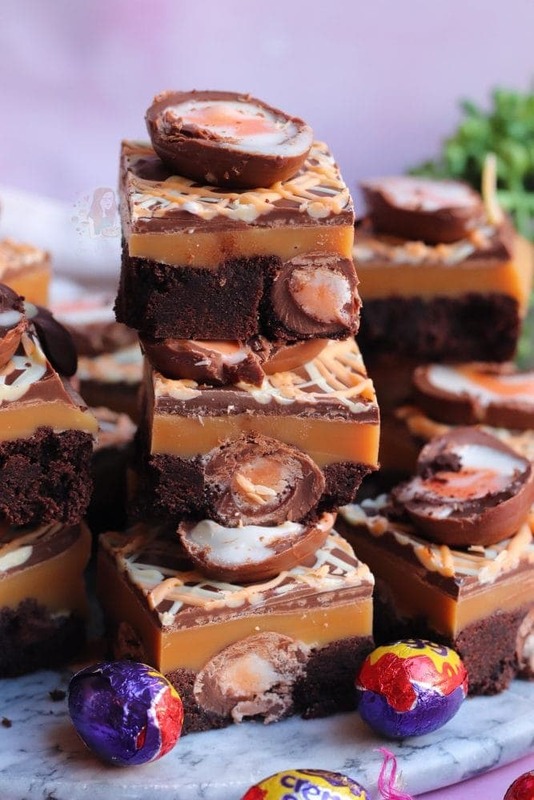 The Creme Eggs in the shortbread are optional, but very well received! 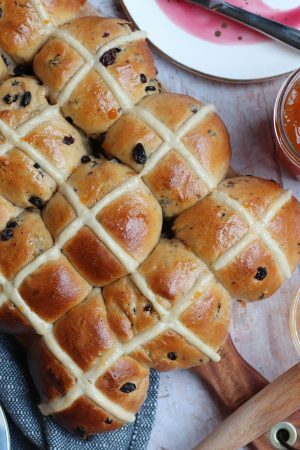 You can make this with a classic shortbread by taking out the Cocoa Powder, and adding in 25g more plain flour! This will last for 1 week - in the fridge will be more solid. I recommend using this 9" square cake tin! And I recommend using this orange food colouring! Older Next post: Mini Egg Cupcakes! 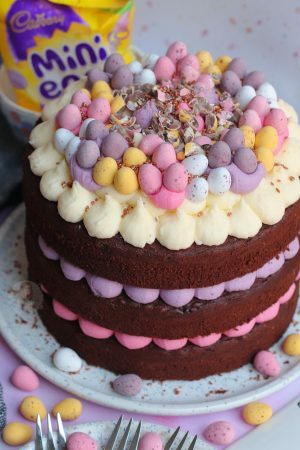 Newer Previous post: Mini Egg Chocolate Cake! Ow wow! Just wanted to say Congratulations on your upcoming wedding and hope all goes smoothly and according to plan. I’m sure you’ll both look lovely, enjoy your day! Is it in the Summer? Have you ever attempted to make caramel using the method where you just add the tin of condensed milk to a saucepan with boiling water and continue to top up the water until it caramelises? I really struggle with caramel and have only ever managed to successfully make it once so I have been intrigued to try out this method. P.s. I’m a huge fan!